Subsidiary of Noor Investment Group, Noor Takaful was created in 2009 and provides a full range of Islamic insurance products for individuals, families, groups and companies in the UAE market. Thanks to their high-standard services and large range of products (medical, travel, home, motor, etc. ), Noor Takaful was awarded as the “Best Takaful Operator 2016”. 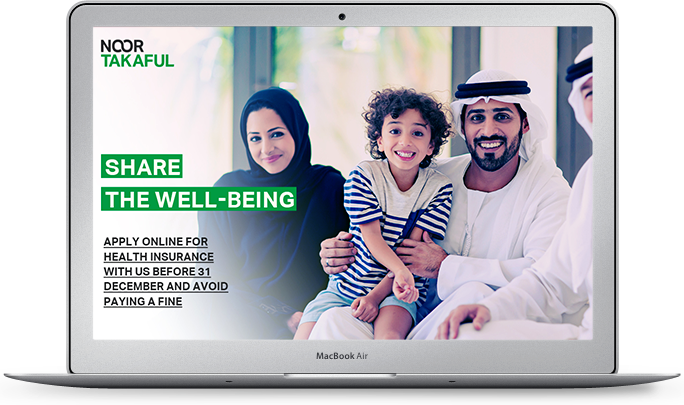 Starting from the 1st January 2017, health insurance is mandatory in Dubai meaning you have until the 31st December 2016 to subscribe to an insurance company to avoid getting fined. In this context, Noor Takaful contacted us in the beginning of November in order for us to increase the number of leads they would get until the deadline. Therefore, we had a short delay to create and manage an ad campaign until the 31st December. We started by looking at the brand itself, its background, its USP mixed with its business objectives. Then we compared Noor Takaful with its market. The health insurance market is full of different providers which were very active on Search Engine Advertising (SEA) and Social Ads for that exact period. We found out that in SEA most of the competitors were competing on generic keywords such as “health insurance” or “medical insurance dubai” but there was almost no competition for more targeted, specific keywords such as “takaful insurance dubai”. Moreover, the more competition there is, the higher CPC (Costs per Click) are. Focusing our keyword strategy on generic keywords would lead to high costs for small reward. Therefore we decided to focus on specific keywords related to “takaful” which also fit Noor Takaful’s overall positioning. These keywords quickly brought us results and the competition soon had to target them. However, we managed to protect our positioning and kept a competitive advantage on these keywords compared to other insurance providers. Protecting your online position and brand is very important. Many of our competitors were not protecting themselves and, therefore, we decided to setup a specific keyword strategy aiming to take their online market share. This means that, when looking for a specific insurance company, visitors would see their ads and would click on it instead of going to the website they were planning to go in the first place. This overall strategy was applied mostly to the Google AdWords Search platform. However, we also worked on Display and Retargeting which had a very low CPC and would bring us back indecisive visitors.